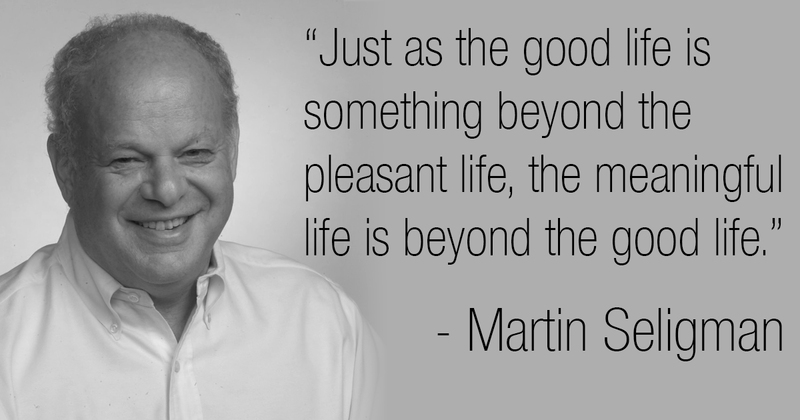 Martin Seligman is a larger than life character. Some call him the "father" of positive psychology. This is perhaps an exaggeration, given that multiple psychologists were already hard at work researching the problem of well-being before he came onto the stage. Nonetheless, he is perhaps the most public face of positive psychology. As the 1998 President of the American Psychological Association, he fought against psychology's focus on deficit and illness, emphasizing the equal importance of helping people thrive above the mean-coining the "Positive," in positive psychology. In this latest addition in our article series about the science behind well-being, we discuss how Seligman's theories about happiness and well-being have evolved through the years. An individual leading a life of pleasure can be seen as maximizing positive emotions, and minimizing negative emotions. An individual leading a life of engagement constantly seeks out activities that allow her to be in flow. Flow, coined by Mihály Csíkszentmihályi, is a state of deep, effortless involvement. It occurs most frequently when we concentrate our undivided attention on activities that are moderately challenging to us. When you are in flow, it may seem that your sense of self vanishes and time stops. Seligman recommends that in order to achieve flow, you must identify your signature strengths, or strengths that are deeply characteristic of yourself, and learn how to practice them. An individual leading a life of meaning belongs to and serves something that is bigger than himself. These larger entities could be family, religion, community, country, or even ideas. For the 2002 Seligman, an individual trying to lead a full life would have to fulfill all three orientations to happiness: She experiences positive emotions; derive engagement and gratification as she exercises her signature strengths; and she uses these strengths in the service of something larger to obtain meaning. The science behind the Orientations to Happiness is sturdy enough. Multiple studies showed that the fulfillment of each orientation correlates with life satisfaction, while the lack of them predicted low life satisfaction. They predict life satisfaction beyond personality and socio-demographic variables. The three orientations also correlate with objective indicators of well-being, such as occupational and educational attainment. Nonetheless, the three orientations aren't equal. Orientations to engagement and meaning were much better predictors of life satisfaction compared to the orientation to pleasure. In fact, some studies found zero to negative correlations between orientations towards pleasure and positive indicators such as life satisfaction and educational goals. Studies conducted in Hong Kong, Taiwan, Australia, Switzerland, and a study which sample included adults from 27 nations found that orientations to engagement and meaning predicts life satisfaction while the orientation to pleasure has a weak to negative correlation with life satisfaction. Sorry, hedonists, looks like you need to get outside of yourself. The 3 Orientations to Happiness was a good theory. But things change. Nine years later, in 2011, Seligman publishes a new book, Flourish. In it, he gives the Orientations to Happiness the cold shoulder and reveals his new brainchild, PERMA (and also talks about himself a lot). Seligman isn't happy with his old theory for a few reasons. First, he criticizes it for being too narrow and containing too few categories. He also puts it down for focusing too much on life satisfaction, which he sees as being too dependent on mood. Well-being, he argues, should exceed the hedonic, and be more than fleeting emotions. In this way, Seligman paints his old theory as one-dimensional, and proposes an alternative: PERMA. Accomplishment involves the pursuit of success, winning, achievement and mastery, both as end-goals and as processes. Seligman argues that many people would pursue accomplishment for its own sake, even when it is devoid of positive emotions or meaning. We look at politicians, and we know this is true. Seligman believes that the need and tendency towards relationships is biologically and evolutionarily ingrained in us. Positive relationships is especially powerful because it plays a role in supporting the other four components of well-being. But Seligman isn't happy with just adding two more categories to his old theory. While the original theory is about maximizing happiness through the three factors, in PERMA, well-being is a multidimensional construct that is defined by its five components, with no single measure defining well-being by itself. Another difference can be found in the place of signature strengths in the theories: while in Orientations to Happiness, your signature strengths only serves to encourage engagement, in PERMA, your signature strengths underpin and contribute to all five elements of well-being. Unfortunately, there are few research studies studying PERMA, so we can't say how valid Seligman's theory is. This is partly due to it being a rather young theory and the painfully slow pace of academic research. A bigger reason perhaps, is that Seligman's theory had to compete with other well-being theories that are much more established. Seligman tries to sell PERMA as the "gold standard" of measuring well-being, but other researchers had already put all their money on theories such as Carol Ryff's Psychological Well-being. Nevertheless, what can we learn from the "father" of positive psychology's two theories of happiness? Don't chase pleasure or positive emotions. You don't have to be sunny all the time in order to flourish. Instead, pursue flow states, and serve something bigger than yourself. Well-being is multidimensional -- there are many parts to it. Understand yourself and your core strengths, and use them everyday. Develop close relationships. Achievement is okay-no need to give it all up to live in a monastery. But also don't focus solely on it. Live a balanced life. If you want sturdy research, you'll have to look elsewhere, but nonetheless, not bad, Martin Seligman. This article is the third in an article-series about the Science behind Well-being. For more, visit David's website, Living Meanings.